Today let's sit here together to notice the full circle of this story. I purposefully left out the ending of this story earlier. Hannah's story doesn't end in 2:11. Hannah had this desire - to have a son, she gave her desire to God, God gave her the desires of her heart, she gave it back to God and God gave Hannah more children - both sons and daughters. Plural. More than one. Hannah asked God for "a son" and God gave her "sons and daughters". I want this to be something I know not only just as Hannah's story - I want this to be my story too. I want to become more and more the kind of woman who brings my heart's desires to God. I want to be the kind of Christ-follower who leaves it all in the loving, wise hands of my Heavenly Father, knowing that He'll give me what is best when the timing is right. 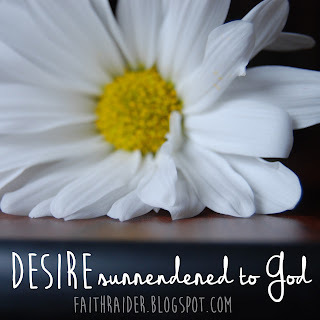 Surrendering desire isn't just letting go of it, like loosing track of it, or pushing it way down deep where you can't see it in your day to day. It's not about secretly being angry or bitter about unfulfilled desires. It's not about chasing what you "ought" to desire. It's about honesty. Hannah walked through month after month, year after year of disappointment. I am guessing you know what that feels like too, I know I do. One of the most effective weapons I have found to fight the enemy of disappointment is the weapon of gratitude. Sometimes when I'm stressed or just having an ordinary run-of-the-mill hard day I find myself making a mental list of everything that has gone wrong in that day. Journaling gratitude helps me re-focus and re-center on everything that has gone right. Gratitude takes those moments and turns them back to God in worship. Respond:What are the areas of your life where you are holding back? Pour them out to Him. Surrender them to Him. Where are you struggling with unbelief? Ask for more faith to trust Him to fulfill your desires. Are you holding out for a specific outcome? Let it go. Surrender the desire of your heart to God. What do you have to express gratitude for today? How can you begin to practice gratitude more intentionally today, this week & this month? Listen: Lauren Daigle "Trust You"
I have been dealing with a lot of bitterness and resentment in one particular area, and this really resonates with me. It is only since really committing to pray hard (and LISTEN when God shows me I need to change) that things are finally changing. He is SO good, and we are SO quick to forget this fact! Ugh! Praise God for his MERCY and GRACE!